Bill Anderson and Jean Shepard. Photo: Chris Hollo. 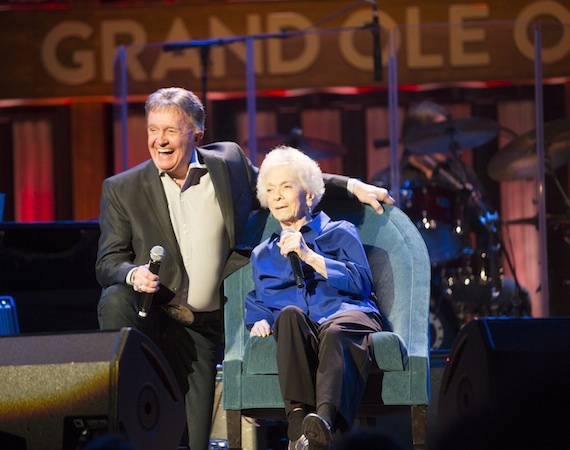 Jean Shepard celebrated the 60th anniversary of her Opry induction on Saturday (Nov. 21). Shepard, the first female to reach 60 years of Opry membership, became an official part of the Opry family on November 21, 1955. Among a host of fellow Opry members on hand at the Ryman Auditorium to mark the occasion were her longtime friends and fellow Opry members Bill Anderson, Connie Smith, Marty Stuart, Mel Tillis, Jeannie Seely, Jesse McReynolds, and Vince Gill. In addition to her Opry anniversary, the day also marks the legendary artist’s birthday and wedding anniversary. Pictured (L-R): Steve Buchanan, Jean Shepard, Bill Anderson. Photo: Chris Hollo, Grand Ole Opry. 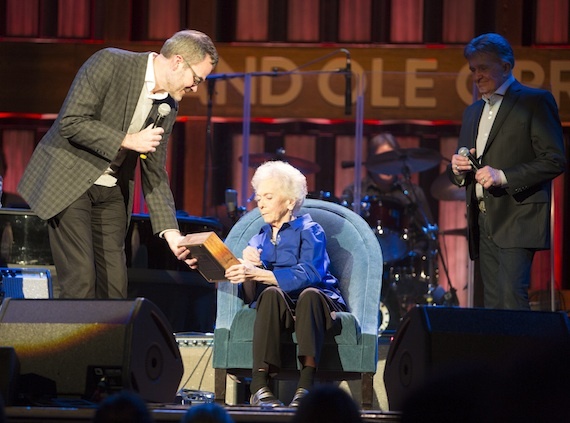 Afterward, Anderson and Opry Entertainment President Steve Buchanan presented the Country Music Hall of Famer with both a gift commemorating the Opry’s 90th anniversary and an inscribed gold locket marking Shepard’s 60 years with the Opry. When Shepard began recording for Ken Nelson at Capitol Records in 1952, there was no precedent in country music for a young woman recording and touring on her own rather than as a member of a family team, couple, or as a band’s “girl singer.” The teenager who dared to sing “Twice the Lovin’ in Half the Time” as her first single would go on to have hard-country hits through the ’50s with “Don’t Fall in Love With a Married Man” and “The Root of All Evil (Is a Man).” Shepard’s hits continued through the classic “Slippin’ Away”. Born in Oklahoma, Shepard grew up in Visalia, California, one of 10 children in a musically-inclined family that listened to the Opry on the radio but had to save pennies to buy a Jimmie Rodgers record once a year. Hank Thompson spotted her when she was just 14, singing and playing bass in an all-girl band she’d formed called the Melody Ranch Girls. Thompson quickly brought her to the attention of Capitol Records. She was an early star, along with Porter Wagoner, of Red Foley’s Ozark Jubilee broadcasts out of Springfield, Missouri, and she preceded Wagoner to the Opry. The announcement that Shepard was joining the Opry came as somewhat of a surprise 60 years ago. The legend remembers being at Nashville’s Andrew Jackson Hotel during the annual Disc Jockey convention with then-Opry manager Jim Denny. In 1960, Shepard married Opry great Hawkshaw Hawkins. The couple had two sons, Don and Harold, the latter born and named for Hawkins after his death in the tragic 1963 plane crash that also took the lives of Patsy Cline and Cowboy Copas. Today, Shepard is married to Benny Birchfield, a musician, singer and member of Nashville’s music community.